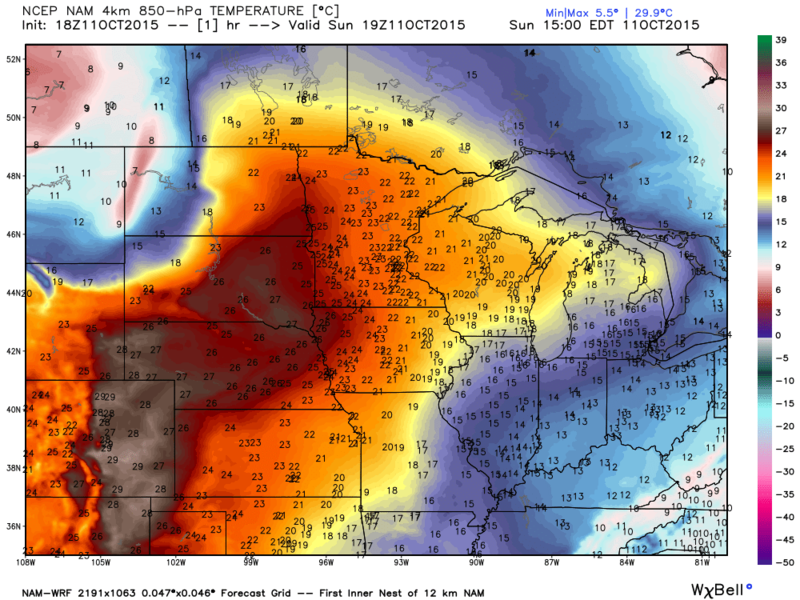 The maximums on October 11, 2015 reach the low to middle 90s, with even a few upper 90s in the central and southern Red River Valley and also in south central and southeastern sections of North Dakota. 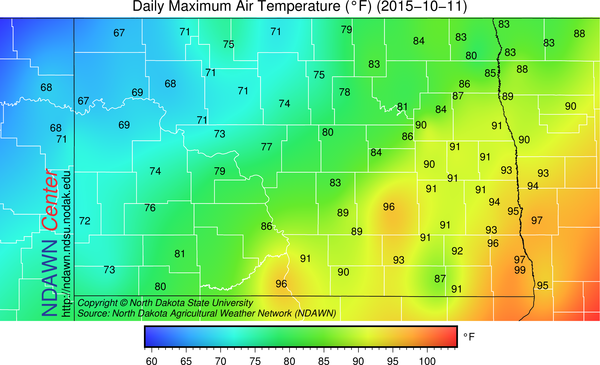 October 11, 2015 Maximum Temperatures at the NDAWN mesonet stations. How are such warm temperatures, some of which are October maximum records achieved so late in the season? Like other such events in October, such as in 2011 and many other situations before that, getting to 90° or warmer in October takes a perfect atmospheric setup to achieve such warmth. Considering that this region tends to only average ten to twenty 90° in a season, this could be said of any time of year. At 18Z (1 PM CDT) Sunday, October 11, 2015 a cold front was trailing southward from a strong mid-latitude cycle situated in central Saskatchewan. That area of low pressure with the counter-clockwise circulation around it allow for a surge of warm up ahead of the cold front. Temperatures aloft at 850 mb of pressure (near 5000 feet above sea level) is presented below for nearly the same time as the surface map above (19Z or 2 PM CDT). The temperatures are in ° C, meaning the 25 degree temperature aloft over Fargo for example would be 77° F. 850 mb is approximately the height to which the atmosphere will “mix” from April through October in the northern plains. Not to go into details, but this mixing would allow air from that height to theoretically descend to the surface from that height. As the atmosphere moves downward, it compresses and warms at a rate around 5° F per thousand feet in “dry” air. Doing the math, under ideal circumstances, and with Fargo residing at an elevation of 900 feet above sea level, the air at 850 mb moving downward about 4000 feet would through compressional warming increase from 77° to 97°. Well, the maximum at the Fargo Hector Airport was 97°, matching the theoretical maximum. This technique is used to forecast maximums by meteorologists all the time. Numerous variables will impact the theoretical and even yesterday there were other features that were involved in getting temperatures well into the 90s. For example, the cold front approaching tends to add to the compressional warming near the surface, this is often referred to as “prefrontal warming”. As the air compresses and warms, relative humidity of the air tends to drop noticeably. The animation below if examined carefully will illustrate that as the front was approaching a given location Relative Humidity (RH) values dropped into the teens then rose again behind the front. The RH drop is a sign of the compressional warming ahead of the front. Besides the warm 850 temperatures with the combination with pre-frontal warming, the area also had dry soils, which lead to low level warming on sunny days, plus, those soils were very much exposed. Exposed in the since that the harvest has made many fields completely free of crops, so vast areas of black soil to absorb and radiate heat back into the atmosphere. So the combination of warm 850 temps, good mixing, pre-frontal warming, sunshine on dry and dark soils all lead to a perfect set up for a phenomenally warm October day. It may have been an October day like April 21, 1980 was when 100° temperature was recorded in Fargo, when a perfect setup lead to that extreme temperature. Sunday may end up being an October day that many of us never experience again, a 90° yes, but flirting with 100° perhaps not.